Pakistan first innings 226 all out (Asad Shafiq 75, Misbah-Ul-Haq 40, Thisara Perera 4-63) and second innings 27-1 (Mohammad Hafeez 8, Azhar Ali 6, Nuwan Kulasekara 1-9) trail Sri Lanka first innings 337 (Tharanga Paranavitana 75, Thisara Perera 75, Junaid Khan 5-70) by 84 runs. The lower order batsmen of Sri Lanka led by Thisrara Perera consolidated the position of their team and took a valuable lead vs. Pakistan in the 3rd Test. Pakistan was bowled out for 226 after they consumed 72.5 overs in the first innings and lost one wicket in their second innings for 27. Sri Lanka gave a positive response by thrashing 337 in the first innings in 100.2 overs and is on the driving seat. The third day’s play of the match came to an end on Tuesday, July 10, 2012, at Pallekele International Cricket Stadium. Earlier, the Islanders started their first innings at 44 for the loss of three wickets from 14.4 overs on day three as the second day of the game was washed out. The opener Tharanga Paranavitana was unbeaten for 13 as Thilan Samaraweera came out to initiate the proceedings of the day. Pakistan needed early wickets to get a command in the match and Sri Lanka required solid batting from their batsmen. Paranavitana got a four in the 16th over as Samaraweera opened his account on the 15th ball with a single and scored his first boundary in the 21st over. They demonstrated a determined innings and the first hundred of the innings was posted on board in the 33rd over. The loose balls were given the treatment required and Paranavitana reached his fifty on the first ball of the 44th over with a four. The home side was comfortably placed at 142 without losing any further wicket in 44 overs at the lunch interval. Samaraweera got a life on the third ball of the second over after lunch when Younis Khan dropped him in the second slip off Umar Gul for 49. The batsman got full use of the chance by completing his fifty in the 48th over as Tharanga Paranavitana kept on cruising runs at the other end. 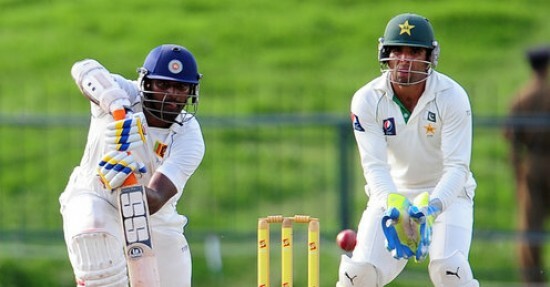 The fourth wicket contributed 143 runs when Thilan Samaraweera was declared leg before wicket off Saeed Ajmal for 73. Tharanga Paranavitana became the sixth victim at 204 runs at his personal feat of 75 and the seventh wicket fell at 236. Pakistan looked like getting back into the game when Thisara Perera and Nuwan Kulasekara joined together at the crease. Perera was dropped by Umar Gul at his own bowling for 11 on the fifth ball of the 81st over. He got another chance as Misbah-Ul-Haq let him off in the first slip off the Umar Gul in the 85th over for 22. Pakistan suffered because of their poor ground fielding and both batsmen opted to attack. Perera clinched 15 runs off the 89th over off Umar Gul with the assistance of one six and a couple of fours. He achieved his fifty in the 93rd over as Kulasekara added useful runs from the other end. The 8th wicket association proved costly for the visitors and enhanced 84 decisive runs as Nuwan Kulasekara was caught behind by the stand in wicketkeeper Taufeeq Umar off Junaid Khan for 33. Tharanga Paranavitana punished Saeed Ajmal for two continuous sixes in the 100th over. He was clean bowled by Junaid Khan and became the last batsman who went back to the pavilion after smashing 75 off 86 balls with 3 lofty sixes and 4 fours. Junaid Khan was the star performer by grabbing five wickets, Saeed Ajmal held three whereas Umar Gul and Mohammad Sami claimed one wicket each. Sri Lanka got a vital first innings lead of 111 runs as Pakistan started their second innings with Mohammad Hafeez and Taufeeq Umar in the crucial moments of the day. The hosts got an instant breakthrough when Taufeeq Umar was declared lbw off Nuwan Kulasekara for just four runs. The first wicket fell at 16 when Azhar Ali got together with Hafeez and survived until the last ball of the day was bowled. Pakistan reached 27 runs for the loss of one wicket in six overs, Mohammad Hafeez and Azhar Ali were at the crease with 8 and 6 runs respectively. Pakistan faces a first innings deficit of 84 runs and will anticipate a positive response from their batsmen on the day four whereas Sri Lankan bowlers will do their best to squeeze the innings of the visitors at their earliest.